This blog originally appeared on www.lift.co. You can see Jamie moderate a panel of legal experts at the upcoming International Cannabis Business Conference, October 13-14. Legalization is on the way in Canada. The government appointed task force is holding consultations from coast to coast, but one thing was missing. Epic road trips require epic playlists. so here’s one for the hard travelling members of Canada’s legalization task force. Obviously, this is what you’re doing. Just a reminder. Be proud. This Contemporary Christian duo were probably not actually singing about cannabis, but about faith. You hold a lot of that in your hands right now. Okay, that’s not why I included it. I just didn’t want y’all to forget about concentrates. 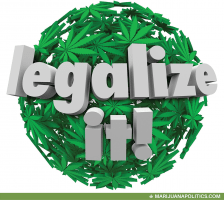 While it may sound fun to get high, remember that that’s not all your legalizing. Banned in the United Kingdom, and released the same year her husband Bob died from cancer, this song’s history highlights the hypocrisy of the drug war. The power this plant has to transform our country is limited only by the regulations YOU propose. Let this remind you of all the money and resources that can be put towards real crime if you get this right. This song is a treasure trove of cannabis culture history, from the slang and trivia in the lyrics, to the artists who performed it. Originally performed in 1936, this Fats Wallers version was recorded in a response to Henry Anslinger’s WWII call for the arrest of swing musicians. Fats was recording a session for distribution to the troops, and included this number, though there is some controversy over wether or not it actually aired on armed forces radio or not. I suggest listening to this when reading anything submitted by Smart Approaches to Marijuana Canada. (And for you Cypress Hill fans wondering why they aren’t on the list, B-Real contributes on vocals). Some have interpreted this song as being about a bible story(?! ), however Time magazine dug up the truth: ‘a rainy day woman is a marijuana cigarette’. Banned from British and American radio, this song has answers for you. ‘Cause one of you has to be an old school metal head. (My money’s on Susan Boyd). Unlike the Bob Dylan song, this one does have a church connection…sort of. Originally recorded by The Coasters, it was written by the duo Ashford and Simpson, who met in church. This version was a #1 R&B hit in America. Hard to choose only one from this album, with tracks like ‘Show me the way to get stoned’ ‘I’ve got some grass’, and ‘I like marijuana’, but we’ll go with the title track here. Mostly I like that the album is called Kush x Orange Juice. Instead of Gin and juice…get it…? This song was censored by MTV and some radio stations so that the word ‘roll’ was blanked out. Oh nineties… Suggested listening time: When the consultees are going on and on and on, and you have another city to get to. I know right? But according to Paul McCartney this song was ‘an ode to pot’. Even the Beatles weren’t safe from prohibition, with Paul being arrested in Japan for possession of cannabis. Perhaps this can form the basis of a public education campaign about the munchies? This live recording wasn’t released until 1975. Janis Joplin. ‘Nuff said. Robert Page protests the events of July 7, 1968, where police made arrests for marijuana possession at a “Legalise Pot Rally” in Hyde Park, London. This garage band single was banned in the US. Just a reminder of that some of our American cousins are ahead of us. Okay, confession: this actually kinda hurts my ears, but the fact that they played this on the Lawrence Welk show makes me smile. And it’s a nice reminder of where people used to buy cannabis. If you don’t like the original, Anthrax also covered it. This musical project combined spoken word with hip-hop beats. This track featured comedian Greg Giraldo. If it sounds familiar to you, it’s because while originally recorded with this title, it would later be rewritten to the classic Why Don’t You Do Right. So, why don’t you? Choice Lyric… erm, actually, ignore the lyrics…just uh, you know, dig that horn. In support of States’ legalization initiatives, Afroman’s remixed 2001 anthem highlights the new reality of cannabis in legal states, building schools, and getting healthy, who knew? Jamie Shaw is a former President of the Canadian Association of Medical Cannabis Dispensaries, a former Director of the BC Compassion Club Society, and co-founder of the first Canadian chapter of Women Grow. She currently consults for dispensaries, serves as Community Engagement Manager at Lift Resource Centres, and is very much looking forward to moderating a panel of Canadian legal experts on these topics at the upcoming International Cannabis Business Conference in Vancouver this October 13th to 14th.